It’s really great to see books like Building iPhone Apps that teach people how to use web app techniques instead of just another book on using Objective C for iPhone, Java for Android, etc. With tools like PhoneGap, Dojo Mobile, EmbedJS, and far too many others to name, hopefully the tide is turning back to using web open technologies for building great mobile apps. Great Marketing in 4 Hours? Will you mentor me. No is a simple article I saw on Hacker News. It should remind you that whenever you’re asking for something, it’s better to add more value than what you’re asking. Get to the point, remember that everyone is always busy, and make the person you’re asking the favor of have a reason to care. And backup what you say with what you do. Seriously awesome physics breakthrough in 2010. And strange irony to be linking to Fox News for its coverage. Now, if I could just find a good climate change article… never mind. I actually still like SVN over Git for many reasons. I find it fundamentally difficult to manage larger projects with Git+GitHub. That said, maybe I’ll learn some new SVN to Git lessons and change my mind? That said, why do we have to all switch to one source control system? Is SVN truly dead? Is Git? It seemed so much easier getting my brain on vim. Everyone is waiting for the dislike button, because right now not liking something is the same as disliking it. That said, while I agree with Stallman on WikiLeaks and freedom, I think the FSF’s article on disliking Facebook because of its control over the net is both brilliant and awful. It hits way below the belt, and comes across as authored by conspiracy theorists and being alarmist, rather than sticking to the provable facts about why a closed ecosystem is fundamentally bad for the world. I never really understand the idea of giving people reason to disagree with you just to draw attention to your point. To summarize: open ecosystem, good, scaring people into not using Facebook at all because big brother can watch you more easily, not good. keep trying to smear him. And he keeps getting stronger. The evil things people do to trick you into using or buying their product. They know what you want. And yes, I know, that’s a title of a great book on a similar topic. Will a better Twitter client come along now that Tweetie for Mac seems all but dead. Twitterific and TweetDeck are both interesting, but neither quite do it for me. I guess if TweetDeck had better UI I’d probably switch. One of the best lessons I learned was not finishing my Ph.D. It seems others are agreeing with the diminishing returns and value of our doctoral degree and near-slave labor system for training new scientists. A truly awesome article on Computing your Skill. I hope to have time in 2011 to finish reading it. In 2011 I plan to try and sleep more. For many many years I’ve averaged 5-6 hours per night. This year I’m aiming for 7. Perhaps there’s an app for that? Bummer, I’m all of these. Have we run out of unique words to describe ourselves? It was a brutal year for two of my favorite services. Are they dead? 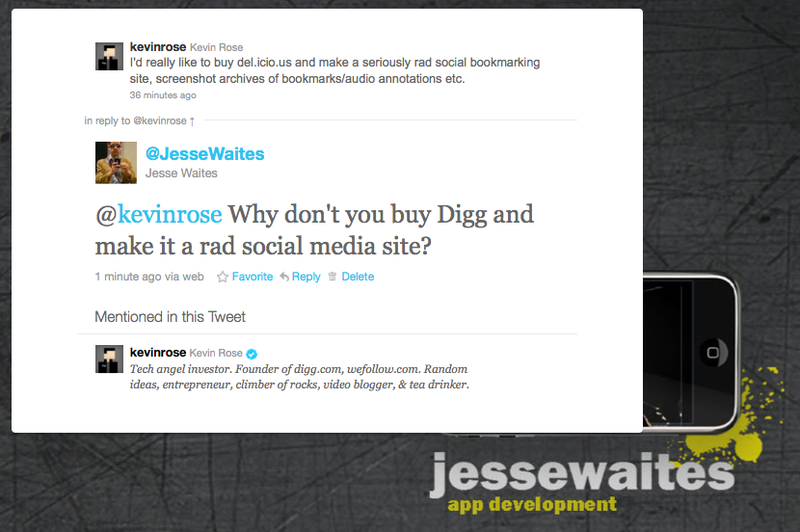 Or has Kevin Rose’s halo effect worn off in a Twitter-centric world? If only social networks were around in previous decades. It seems like many of the good Wii ideas are being morphed onto other platforms. Is FitFu the WiiFit for the iPhone? The world has truly changed for me, as I now find several VCs to be inspiring. Mark Suster’s Both Sides of Table blog is always a good read. I recently enjoyed his post on running more effective meetings. Is Cash Cow Disease really any different than Dutch Disease, but on a corporate rather than country level? 4 web sites I spend far too much time on. The Art of Action offers tricks to learn from the Prussian army and more. Seriously cool article, need to find time to read the book. A prime quote: “Specifying too much detail actually shakes confidence and creates uncertainty if things do not turn out as anticipated. Furthermore, trying to get results by directly taking charge of things at lower levels in the organisational hierarchy is dysfunctional, for a leader thereby “takes over things other people are supposed to be doing, more or less dispenses with their efforts, and multiplies his own tasks to such an extent that he can no longer carry them all out.” Thanks BA for this read on a recent flight. This post originally appears at http://dylanschiemann.com/2010/12/21/on2011/.